Transportation – Specialty Products, Inc. Corrosion is a major threat to concrete and steel bridges, roadways, tunnels, overpasses, and parking structures. Harsh environmental conditions, service duration and airborne pollutants are some of the causes of the world’s rapidly deteriorating transportation infrastructure. SPI offers various polyurea coating for anti-corrosion, waterproofing and nonskid surfaces, which are specifically formulated to protect concrete and steel substrates. Extremely durable, our coatings will withstand heavy vehicular traffic, weather cycling, and salt and chemical exposure. These purpose-specific engineered coatings mitigate moisture ingress, providing excellent impermeable barriers. The effects of strong ground motion, as encountered during earthquakes, and freeze-thaw cycling, also can contribute to the deterioration of transportation infrastructure. Our high-elongation polyureas remain flexible, allowing give with substrate movement, while providing structural integrity. 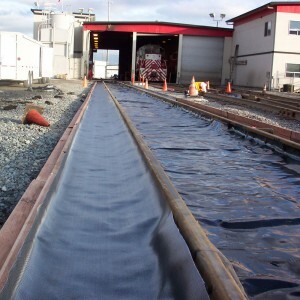 These unique polyureas form a seamless membrane that help to eliminate further deterioration of infrastructure, ultimately extending the service life of this critical infrastructure, which keeps the world in motion.